Barbara Claassen Smucker: children's fiction writer and librarian; born 1 September 1915 in Newton, Kansas, to Cornelius W. (a banker) and Addie (Lander) Claassen, oldest child, only daughter, along with three younger brothers, Lander, Walter, and Morris. She married Donovan Smucker, college professor and minister, on 21 January 1939. They had two sons, Timothy and Thomas, and a daughter Rebecca. Barbara was baptized at age 12 in the Presbyterian Church in Newton, Kansas. At the time of her death she was a member of First Mennonite Church in Bluffton, Ohio. She died 29 July 2003 at Mennonite Memorial Home and is buried in Maple Grove cemetery, Bluffton, Ohio. After attending Bethel College in Kansas for a year, Barbara earned a BS (1936) in journalism from Kansas State University at Manhattan. 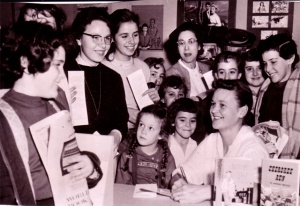 She taught high school English in Harper, Kansas (1937-8), then returned to her home town to work as a reporter for the Evening Kansas Republican (1939-1941). As part of her work she interviewed celebrities who came through Newton on the Santa Fe Railroad en route to California. She interviewed Donovan Smucker when he came as director of the Kansas Institute of International Relations at Bethel College in 1938-9. Following their marriage the Smuckers lived in Wadsworth, Ohio, where Donovan pastored the Mennonite Church and was ordained a minister, then in Princeton, New Jersey, where he received a BD. From there they moved to Mennonite Biblical Seminary in Chicago, where she wrote her first book of historical fiction for children. The Smuckers had invited Seminary neighbors Peter and Elfrieda Dyck to have a meal with them. Usually the Smucker children excused themselves from the table following a guest meal. This time they stayed, captivated by the Dycks' stories of Mennonites in Russia escaping persecution following the Communist takeover. Noting her children's interest, Barbara wrote the story, published by Herald Press in 1955 as Henry's Red Sea, the first of twelve books for children. When her husband served as president of Mary Holmes College in West Point, Mississippi (1967-1969), Barbara was the only white teacher in a black high school. In 1969 the couple moved to Ontario, where Donovan accepted an offer to teach at Conrad Grebel College. There she was children's librarian at Kitchener Public Library (1969-77) and head librarian at Renison College (1977-82). The Smuckers moved to Bluffton, Ohio, in 1993. Smucker will be especially remembered for her work with children. She published wonderful Children’s literature and, as a librarian, influenced many people to appreciate children’s literature. Mennonite Quarterly Review (January 1981; October 2003). Something about the Author Autobiography Series, Vol. 11, Gale, 1991. Barbara Smucker's manuscript collection is housed in the Kerlan Collection at the University of Minnesota and in the Doris Lewis Rare Book Room at the University of Waterloo, Ontario. Rich, Elaime Sommers. "Smucker, Barbara Claassen (1915-2003)." Global Anabaptist Mennonite Encyclopedia Online. December 2004. Web. 22 Apr 2019. http://gameo.org/index.php?title=Smucker,_Barbara_Claassen_(1915-2003)&oldid=143450. Rich, Elaime Sommers. (December 2004). Smucker, Barbara Claassen (1915-2003). Global Anabaptist Mennonite Encyclopedia Online. Retrieved 22 April 2019, from http://gameo.org/index.php?title=Smucker,_Barbara_Claassen_(1915-2003)&oldid=143450.